Do you know how to use apple cider vinegar to remove warts? It really works and I'm proof! I've even got a gross picture to prove it. Today I'll tell you exactly how it's done. (And by the way, as an update, it's now been well over 5 years and it hasn't returned!) Scroll down further for more options just in case this ACV method doesn't work for you for some reason. I've already told you how my good friend healed her son's plantar warts with ACV, and how I healed my own ringworm issues with raw apple cider vinegar, well now I'll tell you how I used it to get rid of a wart on the back of my ankle. Ahhhh, the things I share with you, dear reader friends. Kent can't believe how personal I get here sometimes, but hey, it might help one of you out there! If you just want to know where to get it, find raw organic apple cider vinegar here. Maybe it's normal for it to go this fast, but I sure didn't expect it. I started by soaking a wadded up hunk of kleenex (or cotton ball) in apple cider vinegar and holding it onto the wart on the back of my ankle with a bandaid. (It stinks a little, so I'm glad it was all the way down at my foot.) I did this before bed for 3 nights in a row. In the mornings I took it off. After those 3 nights, it had turned black. But then I forgot about it for a couple of days, maybe this was good, to let it dry out. Then I sterilized some scissors (with steaming hot water), let them cool and clipped the black part off. It was definitely smaller! I washed good after messing with it, just in case it might spread. Then I started the same procedure again, but it started to hurt this time, so I just let it heal up for a few days. Then I did it all again, and this time after only two nights it turned black again. A couple of days later I noticed that it was a little crusty (gross I know, sorry), so I picked the black part off. This time the whole wart peeled off bringing some of it from below the skin level, so there was even an indentation there, COOL! I know, I'm weird that this stuff gets me all excited. It's sick but kind of fun like a science experiment, ha! See how there's another little one next to it? I'm going after that little sucker next. If you've also had good luck, tell us about it and what you did differently. 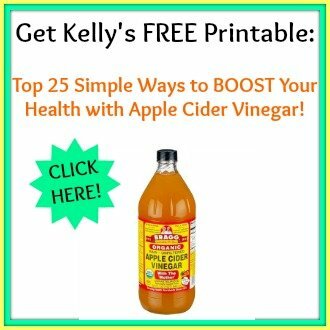 It's so cheap and easy, apple cider vinegar is some powerful stuff! Get raw organic apple cider vinegar here. Once I also tried the same stuff I used to get rid of my skin cancer, and it got the worst of it off, but not as well or as deeply as the ACV worked. Read what Joette's suggestions are for homeopathic remedies to use for warts. Did you know about all the benefits of getting more coconut into your diet? And here are more ideas for how to do that. Will ACV work on skin tags or moles too? It’s worth a try, Heather O’Brien! We’ve not tried it for that but I don’t see why it wouldn’t. It is great for Molluscum Contagiosum as well. These are bumps that look like big whiteheads and are often called water warts. My son got them at camp and my pediatrician said they would go away in 18 months or so, but I used ACV and they were gone in two weeks. (Sarah) We used Vi Protection Blend from Herbs for Kids. It works from the inside out and does take awhile but it was great option for my little one with sensitive skin. I have done this. And yes it really works. I tried five different over that counter things and went to a doctor to have it frozen off three times before discovering this method. Sorry Josh but everyone is different, and I can’t give medical advice or I’d get in big trouble, I can only tell you what has worked for us and for others. Just use common sense and ask your doctor if you’re not sure. Good luck! I had a plantar wart for over 3 years and did not know that it was a wart. I thought it was a corn. Mind you, plantar warts are flat and hard. Had some discomfort walking but otherwise, until a friend noticed it at the beach last summer, I completely ignored it. In December 2015, I started treating it with all of the stuff you find in pharmacies, i.e. Compound W (freezing and liquid), Dr. scholls. Started working but I could tell it was going to take a very long time. Three weeks ago, I started the ACV treatment, and I think it is working better. 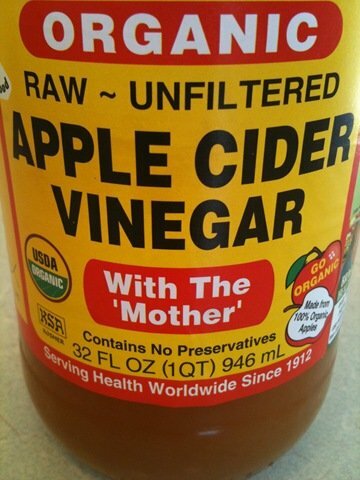 Te first time I used the ACV, I almost soaked by entire foot in pure vinegar and what a mistake (DO NOT DO THAT!!!). For the past two weeks, I put the cotton soaked with ACV on the area every morning and cover the area well with duck tape. Before bed, I remove everything and simply cover the area with bandaids that are more breathable. The next morning, I remove with a tweezer whatever pieces can be removed without much disturbance to the rest before I cover again with ACV soaked cotton. I do not believe that this process will take a little time as so many people have indicated, but I will be patient and see how long it takes. It is getting much better, I can go on long walks and exercise without even feeling that I actually have a “sick” foot. PATIENCE and CONSISTENT TREATMENT!! Will come back and tell how long it took. So far it had been three weeks with the ACV. I cured my plantar wart with garlic in 3 weeks. I had a wart on the bottom of my foot for years. I tried the freeze kits, dr office freezing, and even some type of new machine at the dr office that has to do with burning it with radio frequency. That was by far the worst and cost me around $300 for nothing except pain and a lot of blood. Anyway I started searching for natural cures. I went ahead and painted the wart with clear nail polish and put a piece of duct tape over that for about 1 week. After a week The wart fell out. Too make sure it was gone I put some nail polish into the hole left behind and covered it with duct tape for few days until I was sure it was gone and it is to this day gone. Now I have one on my finger and I tried this method and it’s not working as well so I am trying acv. After 1 day it’s already turning black so Im pretty sure I’m winning the war against it. I have a planters wart on my toe and have tried tea tree oil and duct tape for over two months. There was change but never really began to go away. I started ACV and the first day it turned brown. It has now turned black and crusty and has begun to come off in only 3 days. How long after it comes off should I continue to do it to make sure it is completely dead? Not worth using ACV to remove your warts. Suffer more/longer pain, warts may grow back & long healing. There are better ways than this method. Use mild/diluted tea tree oil antiseptic cream or salicylic acid can do a better job than acv. Able to buy from most pharmacies. Think smart, act smart and don’t fool by this acv method. Cheers! It’s worked for me many times, and without pain, so I’m proof that it does actually work. I recently tried ACV on a wart on my finger and it worked in only a week! It was black after the first day but I did it for two more nights just to be sure, then I left it black for about four days and was able to easily pull the scab off after the week was done. But I do warn people to be careful, as the ACV ended up damaging skin around the wart (inner finger skin is pretty sensitive). I got a large blister that ended up turning pretty nasty, so try to keep the vinegar localized to only the wart. Hi so I’ve been using ACV for 6 days so far on two warts on my fingers. One turned brown with a ring of white sensitive skin around it and seems to be a bit indented (although i’m not certain), the other is starting to get little brown spots on it, these seems to be farther in that the surface. NOthing has turned black though. I’m especially worried about the one that turned brown cuz it looks pretty weird. Is there a way for me to post pics that someone can give me some feedback on? I’ve had a plantar wart for about six months now. I’ve tried everything, compound w, freezing treatments over the counter, digging at it with tweezers. The only thing that has yielded any results at all has been soaking it 24 hours a day in ACV. I’ve found it doesn’t have to be “raw”, even the kind you find in gallon jugs works. After 5 days my wart has started to turn brown, the callus that built up over it was easily removed and I’m confident in no time that painful sucker will be out if my life for good. Warning though; as the wart starts to die off the soaking treatment might become slightly painful (nothing anyone who has been walking around with a plantar wart can’t handle) but do NOT stop treatment, the wart will grow back, and if the virus feels threatened, it will come back more aggressive. Good luck on the road to wart freedom! What’s weird? I really wish I could have seen what your wart looked like before treatment with ACV. The reason? My wart is in the exact same place (ankle) and it is definitely much bigger and different than ones I’ve had in the past. I’m pretty sure that my wart (or lack of it) will look identical to your ‘after’ shot. Off I go. I’m excited to get ‘er gone! After reading your post on skin cancer and the input about adults not getting warts, it makes me wonder if this was truly a wart or if it isn’t true that adults don’t get warts. It’s something to think about. Yeah, mine could be a little mole or something, I don’t really know, but it’s gone now! Also, our son didn’t want to use ACV on his wart so he tried the duct tape and it’s working pretty well! She doesn’t have any feelings in her legs and she has sores all over them. She has tired everything they wont heal for her. I was wondering if she could use the apple cider of vinegar on her legs at all and if she could also take it? I have pics of her legs if that would help so you know what im talking about. Diabetics have circulation problems and I would think that a wound clinic is where she belongs if she has sores that will not heal. My mother had lymph edema in her leg and a wound that would not heal but it did heal after treatment at a wound clinic at the hospital as an outpatient. I agree with DS that you’re Mom should be seen by a doctor, but also, if she has sores that won’t heal that’s a sign that she’s not keeping her blood sugar in the range that she should. Maybe you could help her learn to avoid sugar and limit grains in her diet so she can get her numbers back in a good range, but *be careful* because if she’s taking blood sugar medicine (orally or insulin) and not adjusting that while she cuts back on carbs, it could cause a dangerous blood sugar low. She’ll probably need to work with her doctor to do this safely. Thank you for the tips. I have a really stubborn plantar wart on my foot that I can’t seem to get rid of. I have tried everything including freezing it off and Salicylic acid but none of these techniques have worked. I will try the vinegar treatment and hopefully it will work. I will let you know the results. I was treating what I thought was a wart on my forearm but it would not go away completely. My hair dresser said it might be a skin cancer. I finally went to my dermatologist. I am in my 60s. He said adults do not usually get warts and that it was a squamos cell cancer. It was, indeed. He removed it. It sure looked like a wart to me! Thank you for sharing that information, just in case! never a dull moment on this site! 😉 My question is does ACV work on corns? I’m not really sure what a corn is. Try it and let us know…? Out earth clinic. The key seems to depriving them of air. Even the over counter things will soften and remove the wart. In some people one try is all it takes. I have frozen it off, chewed it off, broken it by accident, used over the counter remedies and it always grows back. It is on the first knuckle of my left hand. I think the key is the terroir – your personal health status. That will determine if your body is a hospitable host for the virus. I think I’ll try FCLO next. I removed a huge wart on my finger a number of years ago with regular vinegar. It hurt like none other, and probably took about a month until it was gone completely (I soaked that sucker once a day for 1/2 an hour and the rest of the time had a cotton swab with vinegar pressed against my finger, wrapped up in a band-aid. Every week or so the wart would fall off, and regrow, until eventually, I killed the roots (I would apply vinegar directly on the roots of the wart every time the actual wart fell out.) Pretty disgusting, painful but highly effective, and no annoying, repeat doctor visits! I used ACV to cure thrush while breastfeeding…it was a lifesaver! After reading this I just had to share. When I was a child (mind you I am 67 years young) I had a wart and was told to rub it with the white part of an eye of a potato. Then I was told to bury the eye and before it would grow out of the ground my wart would be gone. It worked! Since this was so long ago I wanted to check if anyone else used this so I went to the PeoplesPharmacy.com. You should go there. I found many similar but slightly varied stories of the potato solution. It depends on if the wart is the common wart or a planter wart as to how long it will take. Planter warts or more difficult and may have to be treated more aggressively and more than once. But with patience you shouldn’t have to cut them off. You can try placing duct tape over the wart for a few weeks. Many doctors have recommended this. You can try a remedy called wartrol and try two free bottles. Thank you Kelly ! I am going to try this on my finger. I am attempting this with a mole that is about the size of a quarter. Nothing so far, but I need to be religious about swabbing it twice a day. Okay… where shall I send the photo. I took one a while back. A small piece of fresh cut garlic has a similar effect. The wart turns black and falls off after having garlic on it several nights in a row. They can grow back again though, so make sure you keep an eye on it to treat it again right away if it starts to grow. Thanks for sharing. In case you might be interested Patricia Bragg will be on The Power Hour with Joyce Riley tomorrow I’m sure talking about all the other benefits of ACV. @Tyranny, do you have a link or know the time off the top of your head?